The Tropical Analysis and Forecast Branch (TAFB) is a group of highly trained meteorologists who specialize in marine meteorology, tropical meteorology, satellite imagery interpretation, and tropical weather analysis. 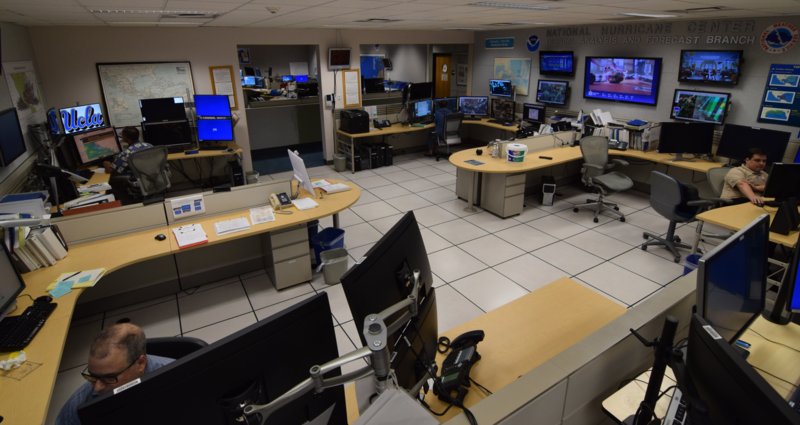 The TAFB is staffed 24 hours a day, 365 days per year with at least three meteorologists working at all times, supplemented by additional staff during hurricane season. As an integral part of the National Hurricane Center, the TAFB performs forecasting, outreach, and support functions. TAFB staff also engages in writing articles and other publications about marine forecasting and tropical weather. Experimental Gridded Marine Forecasts over the tropics and subtropics. More information about TAFB products can be found on the 'About Marine' link. These products are found on our web site under the 'Atlantic and E Pacific' and the 'Analysis Tools' links on the left hand navigation bar. Many TAFB products are available over high seas radiofax on upper side-band (USB). The TAFB radiofax product transmission schedule and frequency list is transmitted daily at 2025 UTC. Transmission is from the United States Coast Guard located at New Orleans, Louisiana, Pt. Reyes, California, and Honolulu, Hawaii. In addition to the normal operational schedule, TAFB provides support for the Hurricane Specialist Unit (HSU) during the hurricane season. This includes satellite-derived tropical cyclone position and intensity estimates, WSR-88D radar fixes for tropical cyclones, tropical cyclone forecast support, media support, and general operational support.